This dish and spoon feature realistically moulded half-open chestnuts and leaves. 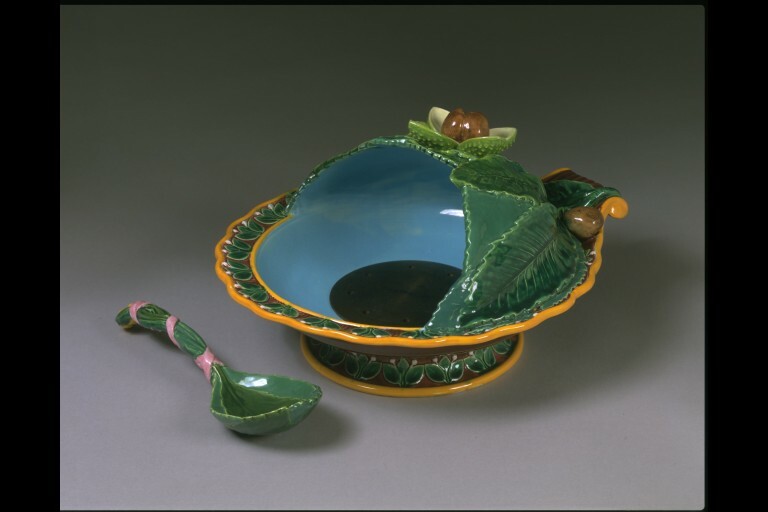 The rich brown and green majolica glazes add to the realism, while the brilliant blue interior and pink ribbon wound around the spoon all add to its attractiveness. The use of decoration to indicate the function of the piece was a Victorian pre-occupation. The development of these rich, natural coloured glazes made this all the more possible. The arrival of roasted chestnuts at the table in such a dish would unmistakably be a treat and generate admiring comments from guests. Among the many forms of Renaissance ceramics that interested Léon Arnoux (1816-1902), art director at the Minton ceramic factory, was 16th-century tin-glazed painted Italian maiolica. 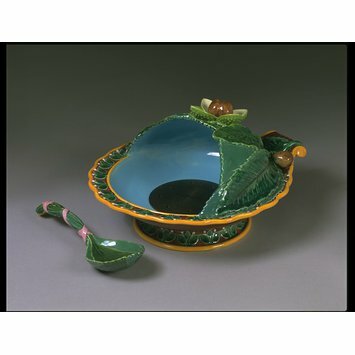 Although Arnoux did produce tin-glazed, painted wares in the style of Italian ceramics, what is now known as majolica was a range of brightly coloured low-temperature glazes launched in 1849 as 'Palissy Ware'. Only later did these become known as majolica ware. By the 1880s this name was commonly applied to all such ware, whether made by Minton or not. This colourful, popular ware is one of the most typical types of Victorian ceramics. Léon Arnoux was art director at Minton from about 1849 until his death. After leaving Paris in 1848, as political unrest escalated there, he travelled around the Staffordshire potteries and was employed by Herbert Minton (1793-1858) at Stoke-on-Trent. Through Minton he became a friend of Henry Cole (1808-1882), first Director of the South Kensington Museum (now the V&A). Arnoux was a designer and chemist and was deeply interested in all branches of the ceramic arts and their history. His contribution to Minton's success at international exhibitions and in their art production especially cannot be overestimated. He was responsible for improvements to the ceramic body, the ovens, the colours and the glazes. He also introduced majolica, 'Henry II' wares and other Minton specialities. 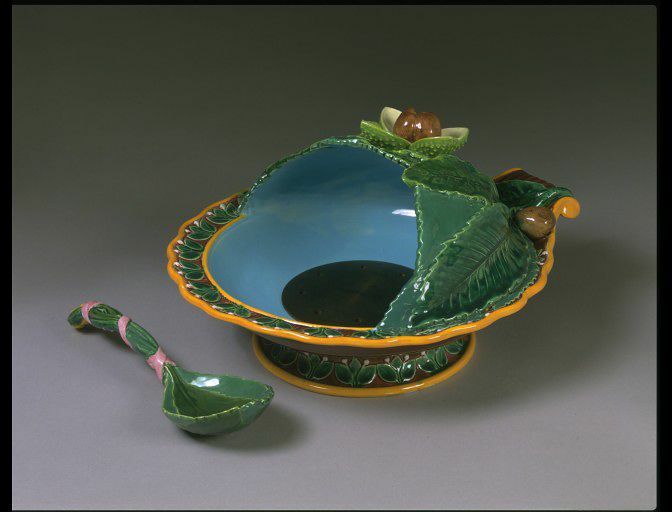 Chestnut dish; earthenware; Minton & Co; Britain; 1857.